J39 Java Pedestal Backwash Shampoo. 16" x 16" cabinet w/ hinged plumbing-access door is free standing. Jeffco suggests installing this unit on 32" centers. When ordered w/ 8600 or 8700 Tilting Porcelain Bowl, bowl includes fixtures & vacuum breaker. J37 Java Add On Shampoo Unit (not pictured) allows bulkhead to be accommodate a tiling bowl. 16" W x 18" D x 23" H cabinet w/ hinged plumbing-access door on front and open back. 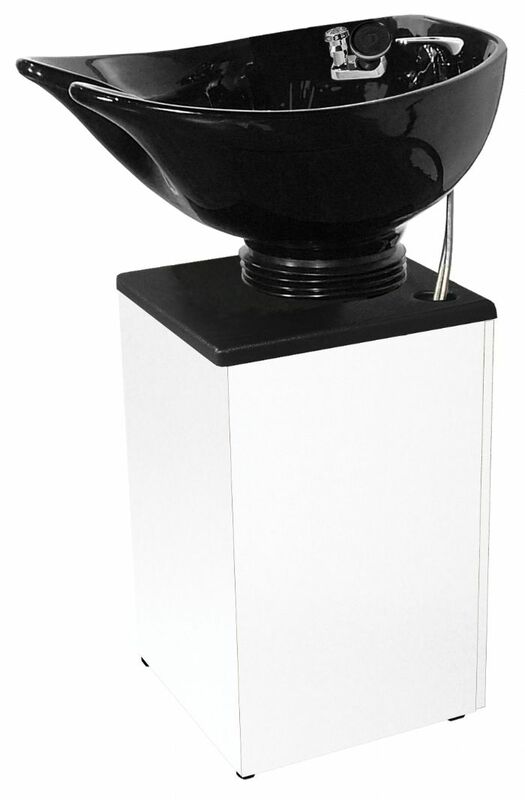 When ordered w/ 8200, 8600 or 8700 Tilting Porcelain Bowl includes fixtures & vacuum breaker. Either unit can be used for backwash or sidewash, as desired.